The number of foreclosures in Hennepin County has been growing at double-digit rates: 43 percent in 2005; 82 percent last year. 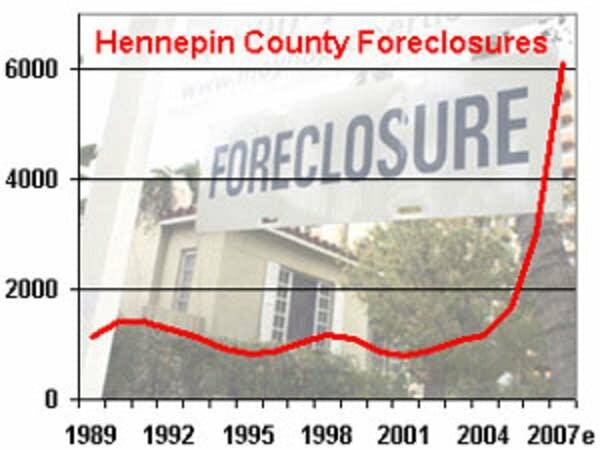 At the current pace, foreclosures in Hennepin County will double this year. "It is definitely looking like we're going to double because the April, 2006 total was 184. We're not even halfway through the month and we've had 171," said Kathryn Janicek from the Hennepin County Sheriff's office, where foreclosures are processed. At the current rate, Hennepin County is facing about 6,100 foreclosures this year, up from about 1,100 in a typical year. If we're actually seeing a doubling of foreclosures before the resetting of interest rates, that is really frightening news because it means that we will likely see that rate accelerate even more. Officials in Ramsey County say they're seeing foreclosures increase at a comparable rate. "We project that of all loans that were made to families in Minneapolis-St. Paul in the year 2006, 20.2 percent of those loans will be lost to foreclosure," said Eric Stein, senior vice president at the Center for Responsible Lending in North Carolina. He says the situation in the Twin Cities is as bad or worse as other cities across the country. Like many, Stein places much of the blame on subprime mortgages. These are high-interest loans usually targeted to people with shaky credit. They can carry hidden fees and are typically adjustable rate mortgages or ARMS. "We call them 'exploding ARMS,'" said Stein. "Eighty percent of subprime loans are loans where the monthly payment after year two jumps up by 40 percent, and virtually no family, unless their income increases by 40 percent in two years--which isn't many--can afford that kind of payment jump." Last year, 22 percent of all mortgage loans originated were subprime. Prentiss Cox, associate professor at the University of Minnesota Law School, has been tracking Minnesota's subprime foreclosure rate. He says many subprime mortgages -- more than $1 trillion worth, nationwide -- are on the verge of a new round of interest-rate hikes. "If we're actually seeing a doubling of foreclosures before the resetting of interest rates, that is really frightening news because it means that we will likely see that rate accelerate even more," Cox said. In the Twin Cities the hardest hit areas are in North Minneapolis and the East Side of St. Paul where you'll find multiple vacant houses on many blocks. There are also clusters in South Minneapolis and Brooklyn Park. Minneapolis City Council President Barbara Johnson, who represents North Minneapolis, says the impact on her district and city taxpayers is unmistakable. "We've been doing analysis of the number of foreclosed homes, how many inspection orders they have on them, how many police calls we get to these vacant properties; and the grass will start growing and we'll be in the lawn maintenance business and that is very expensive," she said. Subprime loans were ideal for investors who bought real estate in hopes of flipping it for a quick profit in a hot housing market. And lenders marketed these loans aggressively. The Center for Responsible Lending estimates that 6.7 million American families are currently holding subprime loans with exploding adjustable rate mortgages. Pat Martyn, executive director the Minnesota Association of Mortgage Brokers, says it's important to recognize that foreclosures are a problem for lenders. "The industry also suffers severely during the foreclosure process because all of a sudden money they lent out is no longer coming back in," said Martyn. "So the industry has a highly energized interest in preventing foreclosures in every area of Minnesota." Legislation designed to do just that is now headed to the desk of Gov. Pawlenty. Friday the Minnesota Senate unanimously approved a bill that tightens restrictions on risky home loans. The bill requires lenders to make sure a borrower can afford to repay a loan. And loan companies couldn't refinance a mortgage if it doesn't benefit the homeowner.